When asked about her suit Abi said “I like wearing my suit because it helps me sit independently. It helps me stand straight with my feet flat. I like my pink suit”. Pam, our Export Manager and Clinical Specialist Physiotherapist said; “Abi is a bright young girl who is determined to get her ‘feet on the floor’ and to do well in school. 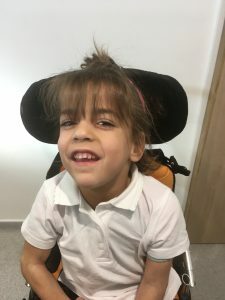 Since having her DMO suit, she has begun to progress faster with her physiotherapy tasks and her ability to sit, stand and take steps – with her feet on the floor. Her speech has also become louder and clearer”. Find out more about the DMO suit here or for training opportunities in the North East of England please contact Pam Cowans, Clinical Specialist Physiotherapist and Export Manager at DM Orthotics.